New residents to the mountains want to get-back-to-nature, seeking solitude, escaping the rat race and are all excellent reasons to live near the forest. Locally we call this the urban-wildland interface. With the woodland lifestyle comes risk though. The primary hazard is the danger of wildfire. As a die-hard gardener, I take the middle ground on fire-wise landscaping. You can have a beautiful landscape design that is also safe. Residences new to preparing for wildfire are often too extreme; fall in love with their chainsaw and cut most plants down in the landscape and rock it over. Let me try to summarize years of wildfire training and teaching that is safe, sane and pretty in just a few paragraphs. The top priority outdoors is creating a defensible space. This area serves as a buffer zone as the fire approaches your home. The goal is to keep a fire moving slow and low until it can be extinguished. Some plants are more flammable than others, and if we thin these varieties closest to the house, it keeps fire close to the ground and moving slow. Evergreen conifers are high in combustible resins and waxes that make them evergreen and durable, except in the case of fire. Closes to the house you should reduce the number of juniper, pine, spruce, and cedars, each is high in plant resins and burn quickly. Replace them with deciduous plants, or those that lose their leaves in winter. Deciduous plants not only hold more water in their foliage, which make them much more difficult to burn, but they drop their foliage during the winter months and reduce combustible materials in the landscape if leaves are picked up in winter. Think camping for a moment. Throw a freshly picked pine branch on the campfire, and it ignites easily with a whole lot of smoke. Throw a leafy oak branch, ash or cottonwood on the same, and it is likely to smolder and wither, and finally catches the blaze only after the hydrating life has been sucked from its limbs. These are the branches that never finished burning and still there the next morning. Fire-wise plants can be beautiful and shine like this Pow Wow Wildberry Echinacea. This ruby toned beauty produces a floriferous flurry of huge 4” raspberry-rose flowers with a darker center. Very difficult to ignite in a wildfire, this outstanding new variety is the winner of the garden acclaimed AAS award. Winning the ribbon by the skin of her pedals for the continual bloom right through the summer heat and into fall. This full-bodied, well branching 20″ plant requires little dead-heading or upkeep and loves the heat. It is possible to have a pretty fire-wise garden that blooms summer through fall. Low resin content much like the Echinacea mentioned. Water and feed the landscape to keep healthy. Water your existing natives once per month in summer until the monsoons arrive. Ornamental landscape plants appreciate a deep soak once per week. A layer of composted mulch helps suppress weeds and holds moisture in around healthy plants, especially helpful in June. Avoid ladder fuels. This is where a dry grass ignites a taller shrub that catches the pine trees on fire, then jumps to the roof. Remember, our goal with a fire-wise landscape is to keep the fire on the ground, out of the canopies and off the roof. Ideally, design garden islands in the yard with an exciting plant mix separated from the next garden island by a driveway, patio or rock lawn. This fire-wise technique allows firefighters some space between gardens to fight the flames. Clean debris that gathers in the gutter and on the roof. Needles and leaves on the roof and gutter provide tinder for blowing sparks. Chip piles of brush and use it as compost or remove it for disposal. There are not enough words in this column for additional plant suggestions, but you have many choices. 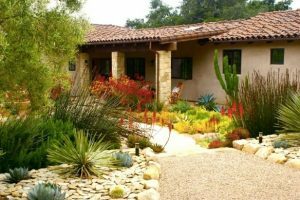 I have written a free garden list highlighting the landscape plants that are fire-wise titled, “Planting a Fire Wise Landscape”. Free for the asking when you visit Watters Garden Center. Continued resources – Are Pine Needles Good or Bad for the Gardens? The right landscape design is critical when planting in the urban-wildland interface. The balance between existing trees, evergreens, irrigation that are balanced with new fire-wise gardens is tricky. It’s easy to get it wrong. Free Garden Class June 16 @ 9:30 am titled “Fire-wise Landscaping Beautiful AND Safe.” The first of the summer class series, we go deep with local landscapes and the best approach to keeping your home safe from wildfire and beautiful, all at the same time. Come early, seats go quickly for this fast-paced session. Ken Lain can be found throughout the week at Watters Garden Center, 1815 W. Iron Springs Rd in Prescott, or contacted through his website at WattersGardenCenter.com or FB.com/WattersGardenCenter .